As I wrote last week in our wrap-up of E3 coverage, the beauty in the Life is Strange games is that they’re quiet and contemplative. When I’m in one, I feel encouraged to stop, take a breath, slow down, and enjoy the scenery. In my job, I often pressure myself to take on too much and wind up playing games too fast or not enjoying the real world outside my own front door. It’s very difficult to do that with Life is Strange. A strong value for human life comes through in every moment of the game, not just for the life of the characters, but in a sense, for yours as well. In The Awesome Adventures of Captain Spirit we are introduced to Chris, a 10 year old boy with a very active imagination. He lives in Oregon with his father, a former star basketball player with a drinking problem, following the death of his mother in a “freak car accident” a few years prior to the events of the game. As with previous installments of the series, the novelty lies in the dialogue and how the lead character interacts with the world around them. Chris can examine the objects in his environment, but sometimes with an added twist; in a particularly playful moment, Chris will become Captain Spirit, using his “powers” to manipulate time and space (or rather, just make real life a lot more interesting). As a demo for the upcoming Life is Strange 2, The Awesome Adventures of Captain Spirit does a great job at showcasing the new or improved technology that Dontnod Entertainment will be using in the game. The atmosphere, in particular, has been perfectly retained. I’m aware that the pleasant feel of Life is Strange is evoked by several techniques meant to tug on the heartstrings: folksy acoustic guitar music, cinematic camera angles and methodical pacing. But it’s effective and I enjoy it. Everything about the game feels thoughtful and placed with care. The only problem with Dontnod being so good at what they do is that, sometimes, they’re a little too good. Captain Spirit will be very difficult for those who have experience with child abuse. One thing that makes the Life is Strange games very powerful is that the dialogue structure encourages the active participation of the player. It tends to have more impact, as a result. I got “stuck” on one screen for several minutes because it put me in a vulnerable position I’ve spent years trying to forget. At one point, Chris’s dad asks about the bruises he is implied to have left on Chris’s arm, a conspicuous row of purple dots that look suspiciously like fingertips. I’d already spent several minutes talking with his dad, carefully navigating my way through the conversation so as not to set him off. But this was different. I was suddenly forced with the option of either admitting to Chris’s dad that the assault hurt, or minimizing it so as to avoid conflict. As I stared at that screen, several minutes flew by as I remembered all the times I’d been like Chris, doing chores and trying to get ahead of the abuse, searching for the right answer so he wouldn’t hurt me again. Later, I wondered if that scene would have the same effect on people who hadn’t lived it, and felt relief that maybe they’d be spared the grief. Once the embargo lifted yesterday and I began to Tweet my thoughts, a friend of mine, another abuse survivor, texted me. “I thought this was a fun, whimsical game? The trailer made it look light hearted.” That’s the thing—it is. Chris is enchantingly childlike, from the intensity of his imagination, to the toys with which he builds his elaborate fantasies. The controls and how he interacts with his environment do a great job of drawing you into his world, and I get the sense that the writers had a lot of fun exploring how to think like a kid. But it also makes the game that much more heartbreaking. Chris’s isolation and loneliness aren’t just because his mother’s gone, or because his best friend lives across town. He desperately needs attention from his distracted, alcoholic father and this is his only form of escape. His vulnerability is so fragile and precious, and watching it get destroyed is agony. I’m starting to worry that my work is too personal. The Life is Strange games, too, are very personal, but what’s strange is how often my life has been mirrored in them. I’ve been Kate, the suicidal religious girl going through a culture shock. I’ve been Chloe, the rebellious Pacific Northwest alternative teen getting in trouble at school and lashing out. I’ve been Chris, vulnerable and at the mercy of an abusive father. So maybe it’s okay that the Life is Strange series affects me so deeply. The writing suggests that none of this pain has been taken lightly. 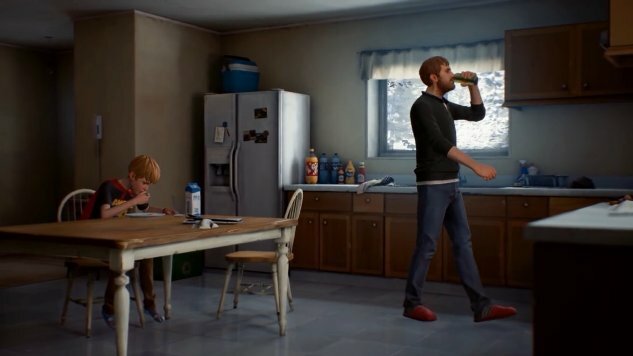 Dontnod has said that The Awesome Adventures of Captain Spirit provides some clues as to Chris’s future and how he ties into the greater Life is Strange universe. The ending provides some hope that things will get better for him—though with caveats and complications and all the pain and mess and confusion that comes from the human experience. And for as much as it hurts, I do look forward to it. The Awesome Adventures of Captain Spirit was developed by Dontnod Entertainment and published by Square Enix. Our review is based on the Xbox One version. It is also available for PlayStation 4 and PC.